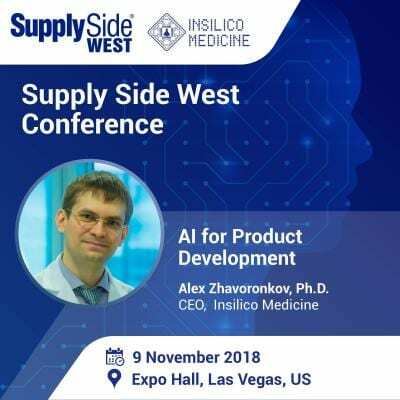 Thursday, November 1, 2018 – Insilico Medicine, a Rockville-based company developing the end-to-end drug discovery pipeline utilizing the next generation artificial intelligence, will present its latest advances in modern drug development at the Supply Side West Conference in Las Vegas, 8-9 of November. Artificial Intelligence techniques (AI), such as deep learning (DL), reinforcement learning (RL), and generative adversarial networks (GANs), – generating as much data as possible – can be used to invent entirely new products. At Insilico AI has been used as a powerful tool to identify targets for drug development, and with the ability to simulate and accelerate research processes, AI helps more drugs to be discovered and come to market quickly. The presentation will focus on the latest advances in artificial intelligence for discovery, development and real world evidence collection of geroprotectors.